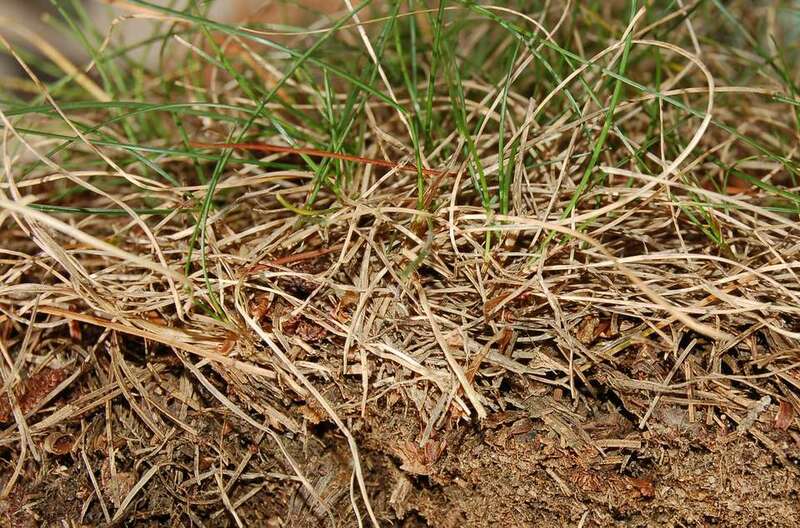 By definition, lawn thatch is the layer of (mainly) dead turfgrass tissue lying between the green vegetation of the grass above and the root system and soil below. This layer, if it becomes too thick (1/2 inch or more), is bad for your grass and must be removed to maintain lawn health. The process of getting rid of mild cases of it is known as "dethatching." Lawn thatch consists of stems, stolons, rhizomes, and roots that have not broken down (or "decomposed") yet. These are tough components of your grass that do not decompose as easily as do grass blades. If it becomes too thick, this layer blocks air, water, and nutrients from seeping down into the root system, where they are needed to sustain your grass plants properly. A thick layer of thatch also promotes diseases and insect infestations in your lawn. But the issues resulting from a thick build-up of lawn thatch go beyond such reasonably intuitive problems. It may surprise you to learn that it can even prevent you from mowing your grass properly. Spots in your lawn plagued by an especially thick layer of thatch will develop a spongy consistency. When you hit these areas while mowing your lawn, the wheels will sink down, which causes you to scalp your lawn. The formation of thatch over time is inevitable. Certain practices can hasten the development of an overly thick layer of it, however. Avoid practices that cause your grass to grow at an unnaturally high rate. Such a fast growth rate leads to the emergence and death of an abnormally high amount of organic matter that cannot decompose fast enough to get out of the way. The result is an unnatural and harmful barrier. Or give it too much fertilizer that is high in nitrogen (the first number in the NPK sequence on a fertilizer bag). In addition, avoid excessive use of pesticides. Why? Because pesticides can kill earthworms, and earthworms are one of your allies against thatch build-up. At bottom, a thatch problem is based on the failure of organic matter to break down properly (instead, it just stays there and forms a barrier). Wherever there is great earthworm activity, the breakdown of organic matter will be hastened. Among the cool-season types of grasses, Kentucky bluegrass is a prime offender. As an alternative, try growing tall fescue grass, which is less prone to excessive thatch build-up. You have similar choices with warm-season grasses. Bermudagrass is a worse offender than zoysia grass. Now you know what lawn thatch is, what causes it, and why it is a problem. But how can you solve the problem? There are two answers (the right one for you will depend on the severity of your problem): dethatching and aeration. In less severe cases, dethatching is a suitable solution. It entails simply removing the thatch by raking it away vigorously. There are special rakes for this work known as "dethatching rakes," but a regular leaf rake will do the job, too. This fact provides you with good incentive not to collect fallen leaves in the autumn with a leaf vacuum, but with a good old-fashioned rake, instead. Why? Because raking is a way of killing two birds with one stone: leaf-cleanup and the removal of lawn thatch. In more severe cases, undertake an operation known as "core aeration." This task is usually done with a machine, known as a "lawn aerator." Check at your local rental center for this equipment (it would not make sense for the average homeowner to buy such a machine, as it would be used only sparingly).